Hot days ahead, with daytime highs in the upper 90s to low 100s, however periods of slight relief are on the way as the Colorado monsoon season begins to build. Sunday's high is expected to be around 100. Look for a slight chance of isolated thunderstorms later in the afternoon, continuing into the evening. Lightning and strong wind gusts will be the primary risks. 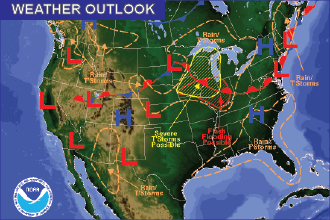 The potential for thunderstorms continues Monday afternoon, and increases slightly during the evening hours as a high pressure ridge located over the central U.S. brings the potential for moisture to stream in from the southwest. Wednesday and Thursday evenings may also bring showers and thunderstorms, however the ridge will be shifting west and limiting moisture. Overnight lows will be in the mid-60s throughout the week. Be alert to the potential for fires throughout the week, and remain cautious about outdoor burning and open flames.